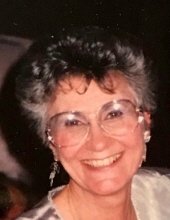 Georgia A. Duncan, age 89, passed away peacefully at the Maples Rehabilitation & Nursing Home in Wrentham, MA on March 23, 2019. She was the wife of the late James E. Duncan. Born April 28, 1929 in Brooklyn, New York, she was the daughter of the late George and Mary (Mascarelli) Cardinale, and sister of the late June Pugliese. Georgia enjoyed telling stories of her childhood during the Great Depression, specifically recalling the time her parents drove to California with her and her sister, June, in search of work, eventually returning home to New York City when they found none. After marrying her husband, Jim, in 1962, they settled in Elmont, NY. She enrolled in college as an adult, earning her BS from Molloy College, and worked as a nurse for many years in New York. After retirement, they lived in Poughquag, NY, and in 2010, Georgia relocated to Plainville, MA to be closer to her son and his family. She spent the last few years in the care of the wonderful Maples nursing staff. Georgia was deeply religious and was an active member in the Catholic Church of each community in which she resided, most recently, St. Martha’s Parish in Plainville. Her hobbies included drawing and painting, as well as photo restoration and framing. She made many friends along the way while walking her dog or attending church. Everyone enjoyed her quick wit, easygoing nature and unmistakable New York accent. She is survived by her son, James M. Duncan and his wife, Lisa, of Foxborough; three grandchildren: Kevin Duncan of NY, and Katie and Brian Duncan of Foxborough, and many dear nieces and nephews. Relatives and friends are kindly invited to attend calling hours on Thursday, March 28 from 4 to 7:30 PM at the Roberts and Sons Funeral Home, 30 South Street, Foxborough. A Mass of Christian Burial will be celebrated at 10 AM on Friday, March 29 at St. Mary’s Church, 58 Carpenter Street, Foxborough, MA, followed by burial in St. Mary’s Cemetery. "Email Address" would like to share the life celebration of Georgia A. Duncan. Click on the "link" to go to share a favorite memory or leave a condolence message for the family.